A lot of sump pump problems can be prevented by performing a small amount of maintenance. 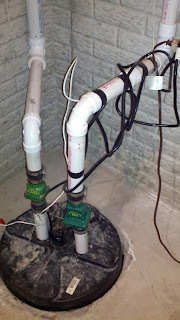 One of the most common sump pump problems is with the float switch. The float switch is set up so that when water reaches a certain level, the sump pump turns on, and when the water goes back down, the pump shuts off. It is always a good idea to check the performance of the float switch on a regular basis by pushing or lifting up on the float switch arm to verify the pump activates. Always check and make sure that the sump pit is free from debris that could have been “washed-in” from the drainage tile. Verify the ‘check valve’ is opening properly. The check valve is set up so that when the sump pump shuts off, no water will go back into the pit. Some, (but not all) pumps will have a weep hole, usually between the sump pump and the check valve. You can clean this weep hole out with a small metal object, such as the end of a paper clip. Be careful not to drop anything into the weep hole. Verify the inlet screen on the intake impeller has not become clogged-up with silt or debris. 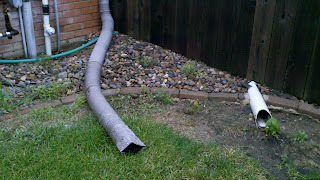 If your sump pump has stopped running, suddenly, or has been making a whining noise, this could be the problem. Although rare, a sump pump pit can cause an odor. This is usually because water is trapped in the drainage pipe and stays there – this problem is usually found on a pit that does not actively get a lot of water in it. If an odor does persist, you can usually solve it by putting enough “fresh” water in the pit to operate the pump. You can also eliminate the odor by using a bleach-water mixture. One part bleach to 5 parts water is good. Again, you can fill the pit until the sump pump turns on, this will help with eliminating the odor better than just plain water. Another great prevention technique to ensure your sump pump operates during a power outage is to purchase an automatic standby generator. This way, if you lose power while you need your sump pump (such as a thunderstorm or blizzard), you will have a back up source of power for the sump pump. The great thing about an automatic standby generator is that you don’t have to be at home in order for your “back-up” power to come on – it’s “automatic”! An automatic standby generator is a great way to provide you with ‘peace of mind’ when you are on vacation or on a business trip. Sometimes, it is better to invest more money now than to have to spend more money later on flooding damages. Hello, my sump pump won't shut off. There is water in the sink hole. I unplugged it and let it rest, don't think this will help much. I think my basement will flood, what can I do temporarily until I can fully repair it?